When it comes to Tesla, attention is usually focused on its production struggles, the latest actions of company founder Elon Musk or, from a technology perspective, its pure-electric powertrains. But with the Model 3, the firm is also aiming to pioneer a new approach to chassis and suspension design. Tesla’s approach to designing those areas, which are crucial elements in defining a car’s character and desirability, didn’t follow usual automotive industry practice for volume car production. Autocar spoke exclusively with a number of Tesla engineers to gain an insight into that development process. Most manufacturers these days build major new models from a platform or architecture, but when it came to the design of the Model 3’s chassis and suspension, Tesla engineer stuck with a ‘first principles’ clean-sheet approach. The starting point were the tyres, which Tesla describes as the unsung heroes of its cars and crucial to feel and drivability. Development started in 2015 and Tesla worked with tyre manufacturers for almost three years, which is longer than the time spent on the Model S’s tyres. Tesla says tyres for a high-performance electric vehicle are challenged in a way that those on a car powered by an internal combustion engine (ICE) are not. A two-wheel-drive Model 3 with a long-range battery weighs just over 1700kg, so tyres have to cope with high loads as well as a 155mph top speed (for dual motor versions) plus continual torque input, either when accelerating or during regenerative braking. The bulk of mass of an EV is usually located lower than in an ICE-powered car due to the battery packs being mounted under the floor. As a result, there is less vertical force build-up through the outside pair of tyres to generate grip when they corner. To tackle that, Tesla focused on tread stiffness, developing new compounds to deliver the desired combination of cornering grip and low rolling resistance. The tyres are filled with sound-absorbing foam to suppress noise amplified inside the tyre cavity. 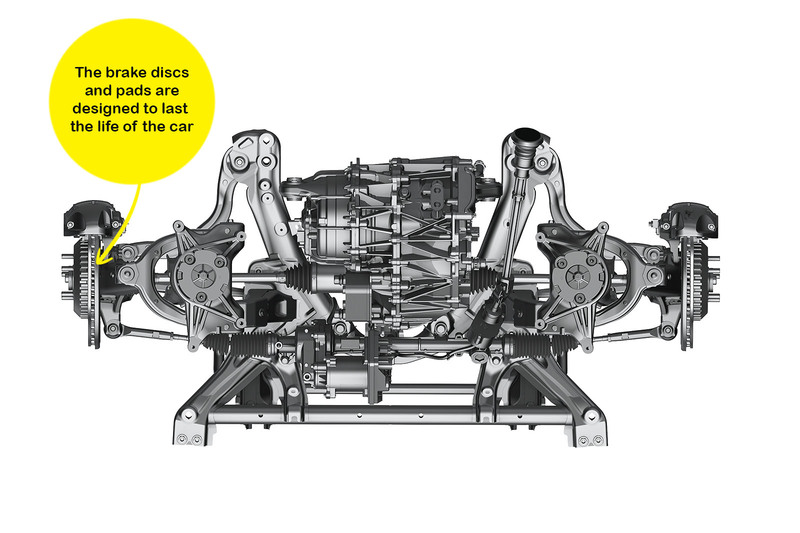 Each rear wheel has six degrees of freedom – five links and one damper, similar to a double wishbone – but the links have been split to give better control over the forces transmitted through the tyre’s contact patch. The front suspension has also been designed to provide maximum protection in the stringent, small-overlap frontal collision crash test. Apart from the direct injury that can occur in accidents, doors can jam and EV batteries can be threatened too. 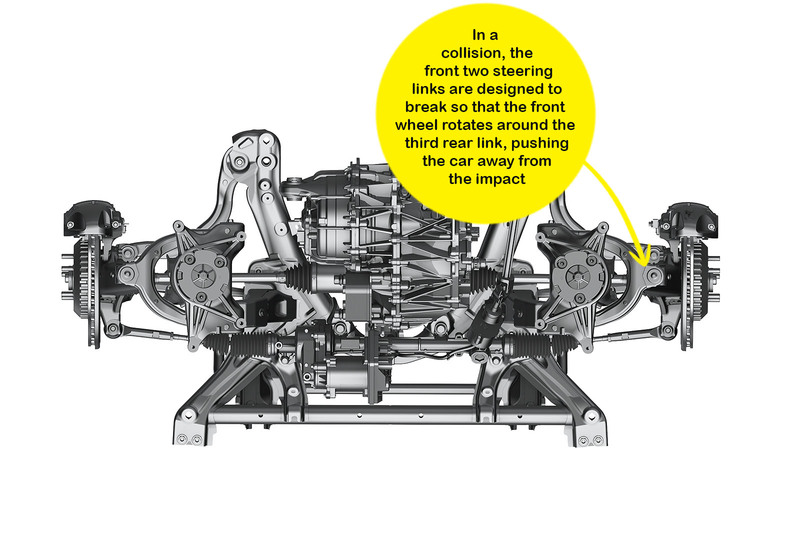 To counter this, sacrificial links are designed to snap when the front wheel and suspension takes a hit. That allows the wheel to rotate around a third link, moving the wheel outside of the body and pushing the car, the occupants and the batteries away from the point of impact. 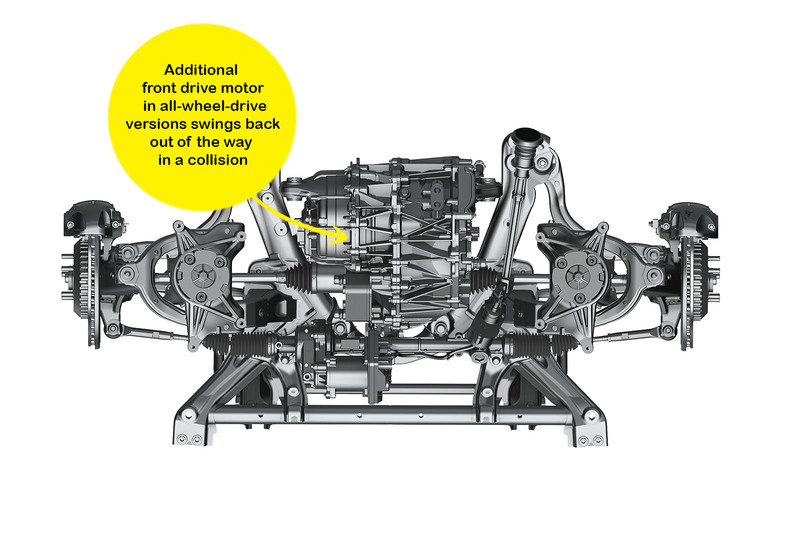 The additional motor in all-wheel-drive variants sits on two mounts in the ‘V’ of the front subframe and pivots backwards into a void in the event of a collision. The electric power steering system has a rapid 10:1 ratio, giving two turns lock-to-lock. The system has full redundancy with separate power feeds taken directly from the high-voltage battery, two electronic control modules and two inverters providing ‘hot backup’ if one fails. Tesla’s engineering team opted to fit more expensive four-pot brake calipers at the front of the Model 3 rather than a cheaper, single-piston sliding version for superior pedal response. That also allowed the firm to design its own piston seals that fully retract the brake pads after braking, cutting drag and boosting the available driving range. The discs themselves have been designed to last for the life of the car (about 150,000 miles), which is possible because the Model 3’s regenerative braking system reduces how much the conventional brakes are used. Rust could be an issue over that time, so engineers developed new anti-corrosion techniques. Such attention to detail is indicative of the development team’s ‘more and’ mantra: if an improvement is made in one area, whether for performance or cost reasons, Tesla’s team commits to making another improvement elsewhere. Tesla drew on learnings from Nasa when refining the Model 3’s suspension settings to ensure the car would be comfortable. The Californian company’s engineers turned to a study by the space agency on the limits of human capability, which included research into how long the body can be subjected to a certain frequency without feeling uncomfortable. The vertical frequency (measured in hertz) at which the suspension moves affects not just comfort but how a car feels to drive, whether it be relaxed and serene or sharp and edgy. Tesla says the suspension of most cars is sprung and damped to move at between 1.0Hz and 3.0Hz. For the Model 3, engineers settled on a vertical frequency for the suspension that is equivalent of a brisk walk or a slow run to give a chassis feel that was comfortable yet sporty enough to harmonise with the performance of the powertrain. The company surely has its share of sensational headlines, and many problems, but I hope they make it in the long term - you can't deny the engineering is fantastic. When so much attention to detail goes into developing the tyres, thenyou know you are on to a winner. These trick tires however must cost quite a bit to replace - that being said, working with tire manufacturers to design special tires has been done before by number of manufacturers - especially in cases of high performance models. While doing so isn't usually the case. Tuning the frequency of the suspension is not unique to Tesla, nor a new idea. NVH is all about tuning vibration frequencies to ones that are comfortable to us. Where does it say Tuning the frequency of the suspension is unique to Tesla? It's implicit, by stating Tesla do this it implies others don't. Anyway, I shouldnt knock an article thats positive towards Tesla for once. As you have nothing to say of any sense use the time to look it up yourself, you irrelevant troll like fool.